Eight years ago the terrorist agents of H.A.V.O.C. triggered a nuclear nightmare that devastated the northern hemisphere, its radioactive aftermath claiming all but a few lucky survivors. Patiently, in scattered colonies deep underground, these survivors have been waiting for the Earth to heal itself, waiting for the day when they could walk once more upon the surface of their shattered world. That day has come...but the real battle for survival has only just begun! 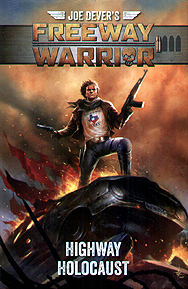 You are Cal Phoenix, the Freeway Warrior, champion and protector of Dallas Colony One. A Murderous gang of H.A.V.O.C. clansmen, lead by the psychotic Mad Dog Michigan, are hell bent on destroying your fragile colony as it crosses the wastelands of Texas on the first stage of its life-or-death exodus to the California coast. These bike-riding clansmen are a formidable enemy: armed, cunning, and extremely dangerous, capable of launching a lightning raid at any time, day or night. You will need all your wits about you if you are to defend your people and reach your destination intact!